Home / I Am Cruel to Dogs / Sometimes I am mean to dogs. Sometimes I am mean to dogs. At 0820 this morning, amid a discussion of why my mother had stickers in her purse, I stuck one that says “BRILLIANT!” on Zille’s nose. It is now 1150. She is still wearing the sticker. I don’t have the heart to take it away from her at this point. 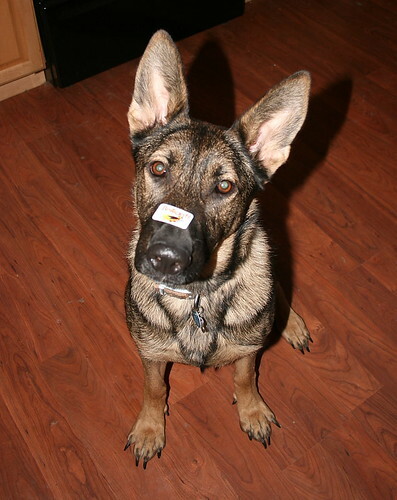 Edited to add: She kept the sticker on her nose until around 1600 when my friend C arrived bringing Nike, a dog Zillekins grew up with. Such was the excitement at being re-united with her buddy, she knocked her sticker off on the fence.